Houses come by their names in various ways: some are christened by the owners, some by their historical role, some receive their identifier from neighborhood folklore, and it is surprising how these names can stick over decades. In the case of a classic modern beach house on the bluffs in Dana Point, the owners never suspected that it already had a name and neighborhood fame before they ever saw it. 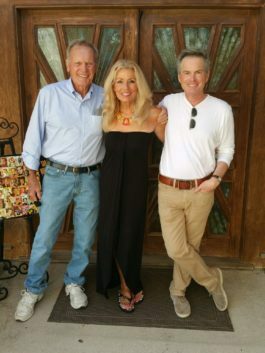 Kari and Paul bought the house in 2005 and only afterward learned that from 1980-84 it had belonged to the movie star and Hollywood icon, Tab Hunter. 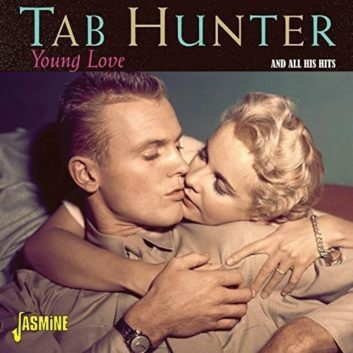 Tab Hunter was a Hollywood mega-star from the 1950s onward with iconic surfer-boy good looks, who rose to the highest ranks of stardom as a heart throb for several generations. He starred in over 40 films, had a hit song on the Billboard chart, and was an overall Hollywood sensation for decades. Despite the fact that he lived in Dana Point only four years, the house was, and remains, referred to as “The Tab Hunter House.” There are still people around who remember the years Hunter lived in the house — the high privacy hedge, the perimeter gate, and the sounds of parties behind them. 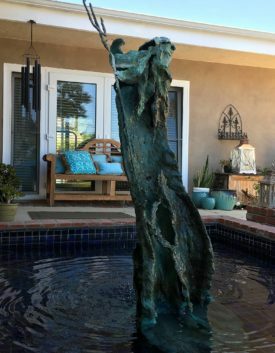 After purchasing the home Paul and Kari learned a neighbor across the street had possession of a fountain statue (acquired from a subsequent owner of Tab’s house) which reportedly originally graced Tab’s reflecting pool. Upon inquiring if the statue could be returned, Paul was told by the neighbor “it had provenance” as reportedly being a gift from another Hollywood icon, Rock Hudson to Tab. Provenance came at a price, which was gladly paid to return the statue of the god Neptune to its original setting. As a child Kari had adored Tab, who starred in movies such as Damn Yankees and Battle Cry, and Ride the Wild Surf, and, most recently, Grease 2. The star also had a hit song “Young Love” which sold over a million copies — a huge success at the time. He was one of the handsomest movie stars ever, and later became a gay icon in the John Waters’ movie Polyester. 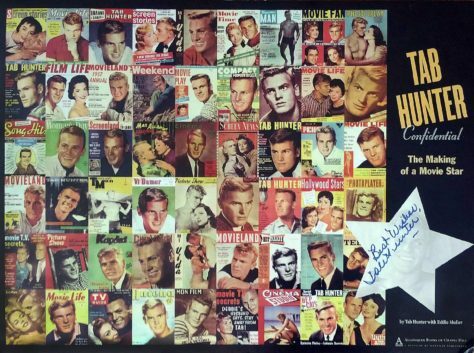 He published his memoirs (Tab Hunter Confidential), which was made into a documentary film by the same name in 2015. Kari explained to Dana Pointer that she and Paul had had a tangential relationship with Hunter through misdirected mail: after all those years, movie studio mail continued to arrive addressed to Tab at the Dana Point house, which brought a smile upon arrival and was gladly forwarded to Hunter at his Montecito home. 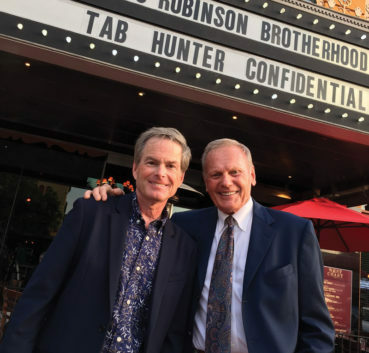 Tab Hunter was a bona-fide movie star, which made it all the more unlikely that Hunter and his partner Allan Glaser would actually stop by to meet Kari and Paul when on their way to a gathering of equestrian friends at the Del Mar racetrack — but that is exactly what happened. 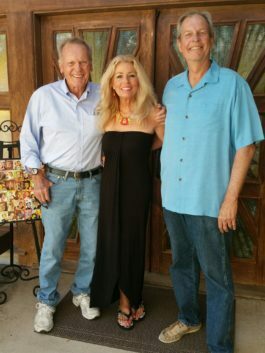 Prior to meeting, the two couples had exchanged emails regarding the 2008 Dana Point Historical Society home tour, which included The Tab Hunter House. Tab sent a wonderful poster for the event. And then, one day not long ago, Tab and his partner wrote that they wanted to stop by, just for a few minutes. The few minutes turned into an hour-and-a-half visit, as they discussed Japanese silk wallpaper, parquet floors, a sunken Roman bath, what the house had been like in their time (little, it turned out, had changed), and more. Both Paul and Kari found Tab and Allan to be quite charming. “We didn’t know what to expect. But he was gentle, he was kind, and he was authentic,” said Paul. Kari could not help remarking on how attractive Tab in his still-active 80s was. Paul, however, liked the discussion of the parquet floors, since Tab revealed that while living in the house, he had modeled the floor pattern on that of the Palace of Versailles, France. Paul and Kari, long before, had fallen in love with the unique parquet design to such a degree that Paul collaborated with his friend and neighbor, John Shirley, to reproduce hundreds of squares of the complex design by hand in John’s wood-working studio. 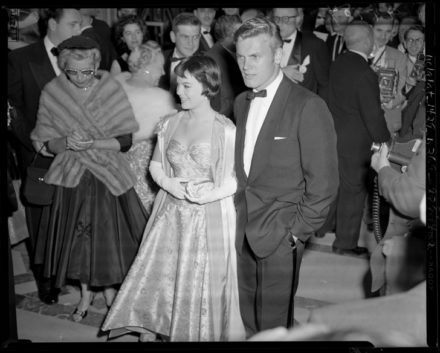 Tab Hunter had chosen Dana Point to have privacy from his Hollywood life (“He wanted to be off the grid,” said Kari), but eventually work meant he had to move closer to Los Angeles. Kari and Paul, of course, asked about the St. Joseph statue during their visit with Tab and Allan, to which Tab answered that he had indeed retrieved the statue after the sale closed. Despite being in exceptional health, the 86-year-old Tab Hunter died this past July. 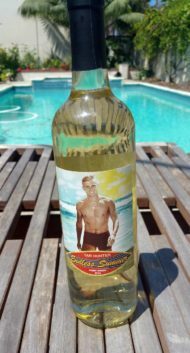 His name lives on at “The Tab Hunter House” in Dana Point.